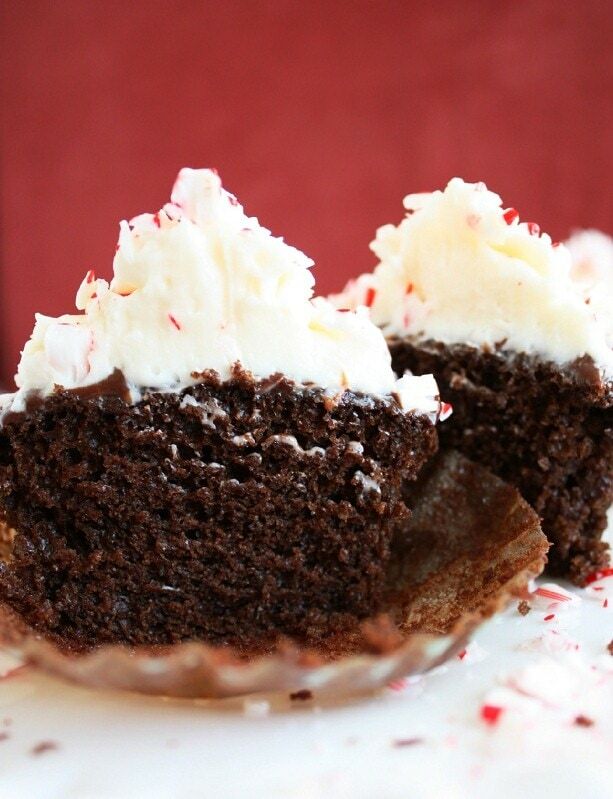 Peppermint Chocolate Cupcakes – the perfect holiday treat! 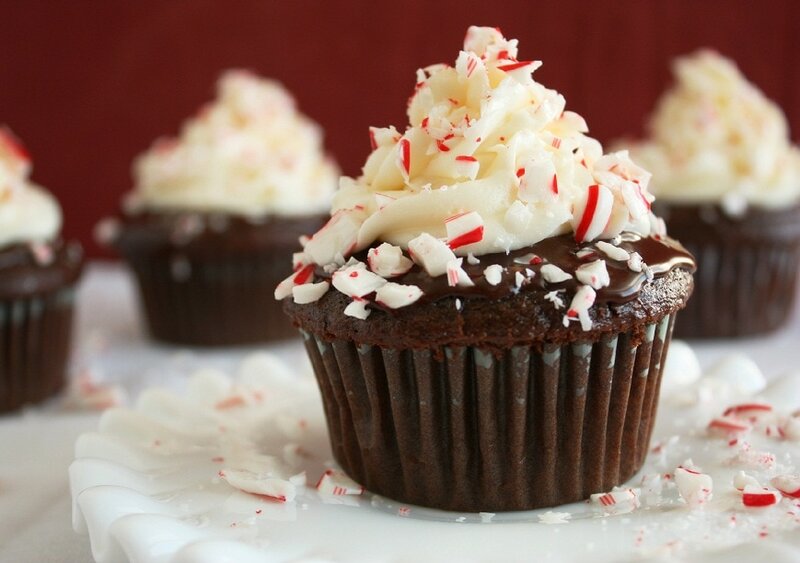 These are deliciously chocolatey and you’ll love the flavor pairing with peppermint. 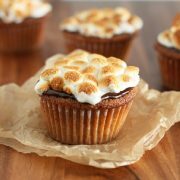 I am so excited, I have finally come up my favorite chocolate cupcake recipe! I’ve tried so many chocolate cupcake recipes before and have never really found one I fully love. They are too dense, too dry, too oily, or they have too much cocoa. So, I decided to create my own recipe. I love this chocolate cupcake. I also love that these cupcakes are so fluffy and pretty, you take them out of the oven and they don’t sink down and flatten. They hold their pretty, rounded top shape. Another great thing about these is the simplicity of this chocolate cupcake. You don’t have to melt chocolate or boil water. You simply combine all the dry ingredients then add in the rest. Bonus, it’s made from basic ingredients you probably always have on hand which is nice. Of course if you are using this recipe for a basic chocolate cupcake (non-peppermint version) simply omit the peppermint extract and increase the vanilla to 1 tsp then top with your favorite frosting. 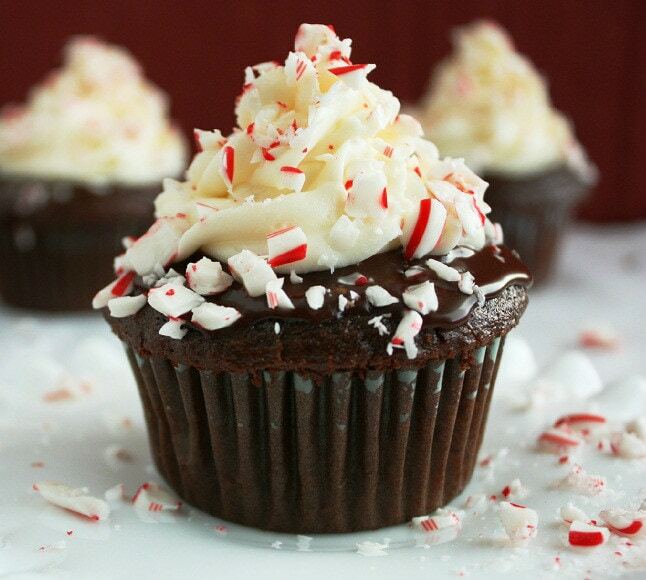 I love the combination of flavors in this peppermint chocolate cupcake version. You get a peppermint chocolate cupcake, topped with milk chocolate ganache, piped with peppermint cream cheese frosting and it’s finished off with a sprinkling of crushed candy canes. I wanted to eat every last one =). If you are totally against cream cheese frosting you could also use a buttercream frosting in its place and it would be delicious as well. When I was creating this recipe I was trying to decide between the two, cream cheese frosting or buttercream frosting. I decided to go with the cream cheese because I wanted this to be a decadent, show stopping cupcake. Cream cheese adds more decadence than the basic buttercream frosting would, also it adds another flavor that blends so perfectly with the chocolate and peppermint. I hope you enjoy these cupcakes as much as I do =). Have a very Merry Christmas! The perfect holiday treat! These are deliciously chocolatey and you'll love the flavor pairing with peppermint. Preheat oven to 350 degrees. In a large mixing bowl whisk together flour, brown sugar, granulated sugar, cocoa powder, baking powder, baking soda and salt. Add in vegetable oil, milk, egg, vanilla extract and peppermint extract and beat with an electric mixer on low speed for 2 minutes. Stir in hot water, stir until well combined. Add in sour cream and mix until well blended. 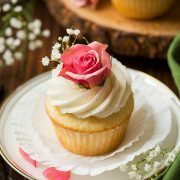 Fill paper lined muffin cups ¾ full and bake cupcakes in preheated oven for 17 – 19 minutes, until toothpick inserted in center of cupcake comes out clean. Remove from oven and allow to cool several minutes in muffin pan before transferring to a wire rack to cool. Cool on a wire rack for 30 minutes. 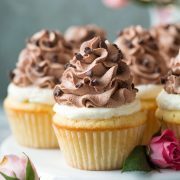 Once cupcakes are cool, spread about 1 teaspoon cooled milk chocolate ganache over each cupcake. Place cupcakes in a 13x9 inch baking dish, cover with plastic wrap and chill about 10 mintues while you make the peppermint cream cheese frosting. Pipe each chocolate ganache covered cupcake with peppermint cream cheese frosting and sprinkle cupcakes with crushed candy canes. Combine milk chocolate chips and cream in a microwave safe bowl and microwave mixture on 50% power in 30 second intervals, stirring after each interval until melted and smooth. Cool mixture in refrigerator for about 10 minutes (basically until it’s a spreadable not so drippy consistency). In a large mixing bowl, using an electric mixer, whip together butter and cream cheese until fluffy, about 1 minute. Stir in vanilla and peppermint extract. Slowly add in powdered sugar and mix until well combined and fluffy. Jaclyn: Sorry for the late response but I think it would be fine to freeze the left over frosting. Shelly: I made these last night and they are amazing.